CHARLOTTE — Last Saturday and Sunday in the heart of the Queen City, Panini America celebrated NBA All-Star Weekend just minutes away from the Spectrum Center and within punting distance of Bank of America Stadium with a festive, fun, engaging and interactive NBA All-Star VIP Lounge on the fifth floor of the Terrace at Cedar Hill. 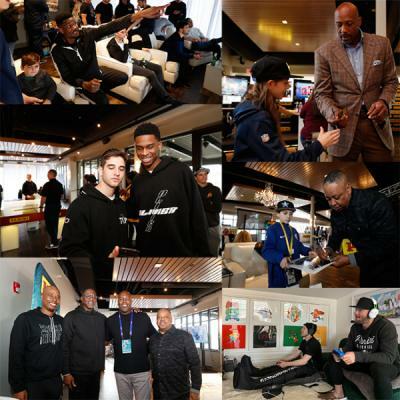 Throughout the day on Saturday, an all-star cast of NBA luminaries — Alonzo Mourning, Dominique Wilkins, DeAndre Ayton, Jaren Jackson Jr., Spud Webb, Quentin Richardson, Darius Miles, Shai Gilgeous-Alexander and Glen Rice — kept making unforgettable memories with Panini America guests, business partners and friends. And in the middle of the sprawling venue on a massive, multiple-screen setup, Team Complexity professional Fortnite players Hogman and VVPunisher created a squad for the ages as Super Bowl LIII MVP Julian Edelman joined from Boston to stream live from the Panini America Twitch channel. It was an unforgettable weekend in Charlotte and in the gallery and video that follow, we take you behind the scenes for some of the action. Enjoy . . .
And here are the pics . . .